The show that introduces newcomers to the world of comics and connects it to the shows and games you already know and love. New episodes every Thursday! 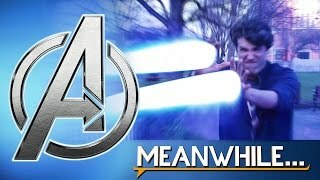 Avengers Greatest Battles (Meanwhile Season Finale) | Meanwhile... The Avengers are the biggest team in comics and the stars of Marvel's new movie Avengers: Age of Ultron. In this episode, Nathan digs into their greatest battles, and where to start when you want to read some of the best Avengers stories. Also, Megan is evil and she's pissed. Nathan has to find a way to beat her and continue the episode! Thanks to Stephen Paunovski for helping out on crew to make this episode the best it could be. Where to start with Avengers comics | Meanwhile... The Avengers are the biggest team in the history of comic book movies, so with their newest movie Age of Ultron coming out, we figured it was time to talk about how the team came to be and where to start when you want to read Avengers comics. In this episode Nathan gives some backstory on Earth's Mightiest Heroes along with great places to start reading. He also talks about what the team is up to nowadays and how to jump into current stories. Make sure to subscribe, we release new videos every Thursday! 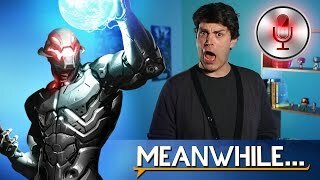 Where to start with Ultron comics | Meanwhile... Ultron is the title character in the new Marvel film "Avengers: Age of Ultron", but who exactly is Ultron and where do you start when you want to read his comics? In this episode, Nathan dives into the backstory of the evil artificial intelligence, and gives great places to start reading. He'll also talk about what he's up to in the comics lately and how to jump into current stories. Who is John Constantine?! | Meanwhile... John Constantine has been the driving force behind a film starring Keanu Reeves and NBC's TV show Constantine. He'll even be in DC Comics and Guillermo Del Toro's upcoming Dark Universe movie. But people still ask the question "Who the hell is John Constantine?" 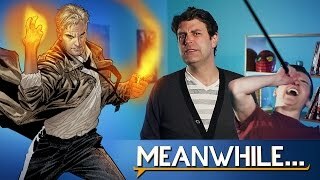 In this episode of Meanwhile, Nathan digs into the backstory of the Hellblazer and gives great places to start reading his comics. He'll also talk about what Constantine is up to nowadays and how to jump into current stories. Where to start with Ra's Al Ghul comics | Meanwhile... Ra's Al Ghul has been the main source of conflict in the CW show Arrow and a major villain in Christopher Nolan's Dark Knight trilogy. But who is Ra's Al Ghul and where do you start when you want to read his comics? 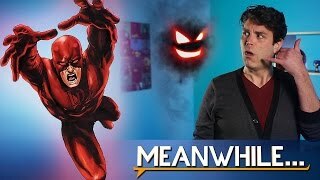 In this episode of Meanwhile, Nathan digs into the backstory of the Demon's Head and gives great places to start reading. He also talks about what Ra's is up to in the comics recently and how to dive into the current story-line. Where to start with Daredevil comics | Meanwhile... The new Netflix series "Marvel's Daredevil" is about to release their entire first season, but who exactly is Daredevil? 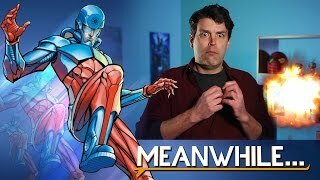 In this episode of Meanwhile, Nathan digs into the backstory of the Man Without Fear, and gives great starting places to start reading his comics. He also talks about what Daredevil is up to nowadays and how to jump into current stories. 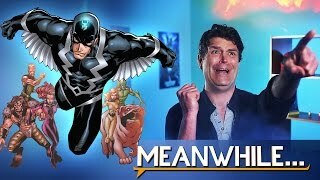 Who are the Inhumans?! | Meanwhile... This season, "Marvel's Agents of S.H.I.E.L.D." is introducing the Inhumans to their Cinematic Universe, and there's even an Inhumans movie coming down the pipeline. But who exactly are the Inhumans, and where do you start when you want to read their comics? 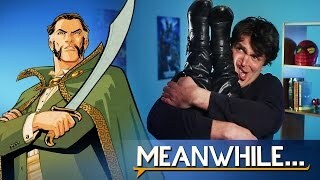 In this episode of Meanwhile, Nathan explains the backstory behind Marvel's strangest characters, and gives great places to start reading. He also talks about what they're up to these days and how to jump into current stories. 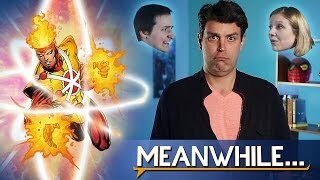 Who is the Reverse Flash (aka Professor Zoom)?! | Meanwhile... "The Man in the Yellow Suit", the Reverse Flash, made his dramatic entrance on The CW series "The Flash". But who exactly is this mysterious villain? 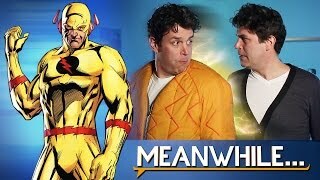 In this episode of Meanwhile, Nathan explains the history behind two different characters who have claimed the alias "The Reverse Flash" in the comics, and gives great places to start reading. He also talks about what Reverse Flash is up to these days and how to jump into current stories. Where to start with Scarlet Witch comics | Meanwhile... Elizabeth Olsen stars as the Scarlet Witch in Marvel's "Avengers: Age of Ultron". But who is Scarlet Witch, and where do you start when you want to read her comics? In this episode, Nathan dives into the back story of the Wanda Maximoff and gives great places to start reading. He also lets you know how to jump into current stories. How to start reading the Atom comics | Meanwhile Brandon Routh is taking on the role of Ray Palmer on the third season of The CW show, Arrow, and we're getting watch him become the size shifting hero, The Atom. But how did the character The Atom come to be and where do you start when you want to read his comics? In this week's episode, Nathan dives into the back story of the character and gives great places to start reading. He also lets you know how to jump into current stories. Who is Jessica Jones?! | Meanwhile... Krysten Ritter and David Tennant are taking on lead roles in Marvel's new Netflix series, AKA Jessica Jones... But who the hell is Jessica Jones? In this episode, Nathan explains the origin behind Marvel's retired hero turned private investigator, and gives great places to start reading. He also talks about what she's up to nowadays and how to jump into current stories. How to start reading Firestorm comics | Meanwhile... Robbie Amell and Victor Garber are both taking on the role of the composite hero Firestorm in the CW series "The Flash". But how did the character Firestorm come to be and where do you start when you want to read his comics? In this week's episode, Nathan dives into the back story of the character and explains how Ronnie Raymond and Martin Stein collaborate to become the hero Firestorm. He also gives great places to start reading and lets you know how to jump into current stories. How to start reading Fantastic Four comics | Meanwhile... A new Fantastic Four film is coming up and peaking the interest of many superhero movie fans. But how did the Fantastic Four come to be and where do you start when you want to read their comics? In this week's episode, Nathan dives into the back story of Marvel's First Family, gives great places to start reading, and lets you know how to jump into current stories. What the hell is Secret Wars and Marvel's Multiverse? | Meanwhile... Marvel just announced the end of their comic book universe in Secret Wars, but what is it all about and how exactly does their multiverse even work? Nathan makes sense of Marvel's Multiverse and explains what to look out for in Marvel's Secret Wars event. How to start reading Black Canary comics | Meanwhile... Katie Cassidy is stepping up to play the Black Canary on the CW show Arrow, and Caity Lotz had her shot at the character as well, but how did the character Black Canary come to be and where do you start when you want to read her comics? In this week's episode, Nathan dives into the back story of both characters who claim the name Black Canary (Dinah Drake and Dinah "Laurel" Lance) and gives great places to start reading. He also lets you know how to jump into current stories. How to start reading Ant-Man comics | Meanwhile... Paul Rudd is taking on the role of Scott Lang a.k.a. Ant-Man in the Marvel Cinematic Universe, but how exactly did the character come to be, and where do you start when you want to read Ant-Man comics?! Nathan takes on Marvel's size shifting character, giving you great places to start reading, and telling you how to jump into the current story. He also digs into Scott Lang's origin as well as Hank Pym's. Thanks to "The Vision" for the suggestion! How to start reading Deadpool comics | Meanwhile... Ryan Reynolds plays Deadpool in both X-Men Origins: Wolverine and the upcoming Deadpool movie, but how exactly did the character come to be, and where do you start when you want to read Deadpool comics?! Nathan takes on The Merc with a Mouth, giving you great places to start reading, and telling you how to jump into the current story. Meanwhile... What are comic book reboots and continuity? | Meanwhile... Jumping into reading comics can be intimidating. That's where Meanwhile... comes in! But part of the reason it's so intimidating is because of the massive amount of writing behind each character. In this episode, Nathan makes sense of continuity and shows how DC Comics and Marvel have used reboots to make reading comics a whole lot easier. 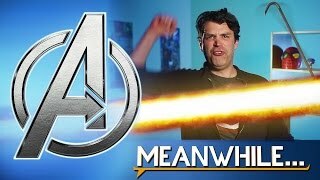 Meanwhile... Trailer Welcome to Meanwhile..., the show that introduces you to the world of comics and connects it to the shows and games you already know and love. Every week, Meanwhile... will be taking a popular, trending character and explore their origin, giving an awesome starting point, and helping you jump onto current stories. How to start reading The Joker comics | Meanwhile... Jared Leto is going to be taking over the role of the Joker in the new DC Universe movies, but how exactly did the character The Joker come to be, and where do you start when you want to read The Joker comics?! Nathan takes on The Clown Prince of Crime, giving you great places to start reading, and telling you how to jump into the current story. Top 3 Christmas Comics | Meanwhile... It's getting to be that time of year again, when we all become hermits that sit in our homes for days at a time. Also it's the holidays, so there's that too. So if you're planning on being a shut-in this holiday season then you're gonna need the perfect Christmas books to enjoy it! Nathan gives you his top 3 favorite Christmas stories this episode, and each are easy for beginners and experienced readers to pick up and enjoy! Who the hell is Savage Dragon? | Meanwhile... Writer Erik Larsen is releasing the 200th issue of his series Savage Dragon, and ComicBook.com asked us to get you started with the character. We'll give you great places to start reading as well as a glimpse at the 200th issue. How to start reading Deathstroke comics | Meanwhile... Slade Wilson (aka Deathstroke), has been a major part in many superhero TV shows, including Arrow and Teen Titans. But how exactly was the character created and where do you start when you want to read Deathstroke comics?! Nathan answers those questions in this episode, along with how to jump on to current story lines! Thanks to Jacob Fox for the request!! Top 3 Comics we're Thankful For | Meanwhile... Nathan breaks down the top 3 most important, influential comics that changed the industry. Without these books, the comics would not be the same! How to start reading Hawkeye comics | Meanwhile... Jeremy Renner is Hawkeye in The Avengers movies, but how exactly was the character created and where do you start when you want to read Hawkeye comics?! Nathan answers those questions in this episode, along with how to jump on to current story lines! Catching Up on Futures End | Meanwhile... Nathan let's us in on what's happened in The New 52: Futures End so far, and how to start reading it. He also talks about the future of DC Comics and what Convergence is all about. Don't forget to subscribe! New videos every Thursday! How to start reading Shazam | Meanwhile... Nathan gives some backstory about Billy Batson, aka Shazam! He also gives great places to start reading and how to jump into current stories. Thanks to Joshyy123 and chen6634 for the video suggestion! The 5 Best Scary Comic Books | Meanwhile... Nathan gives his top 5 favorite horror and suspense graphic novel suggestions. All of which are easy to pick up and start reading right now, just in time for Halloween. How to start reading Rocket Raccoon | Meanwhile... Nathan gives some backstory about... and gives great places to start reading and how to jump into current stories. Don't forget to subscribe, new episodes every Thursday! How to start reading Aquaman | Meanwhile... Nathan gives the back story about the King of Atlantis, Aquaman. He also gives great places to start reading and how to jump into current stories. How to start reading Iron Man | Meanwhile... Nathan gives some back story on Tony Stark (aka Iron Man), and gives great places to start reading and how to jump into current stories. How to start reading The Flash | Meanwhile... Nathan gives the back story about the scarlet speedster himself, The Flash. He also gives great places to start reading and how to jump into current stories. How to start reading Green Arrow | Meanwhile... Nathan gives some backstory about Oliver Queen (a.k.a. Green Arrow) as well as give some great places to start reading and how to jump into current stories. How to start reading Captain America | Meanwhile... Nathan gives some history and great starting points to begin reading Captain America, as well as explore the future of the character as Sam Wilson (a.k.a. The Falcon) prepares to take over. Why you should read it: It's an update to Cap's origin that brings it more in line with the movies, which is perfect if you love the Marvel films. Why you should read it: It's just a kickass Captain America adventure where Cap and Red Skull team up to fight Hitler. 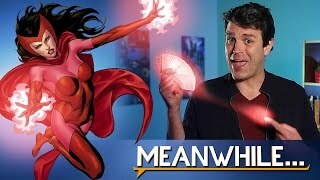 Busting Comic Book Myths | Meanwhile... Nathan answers some common comic book questions and crushes some infamous myths. 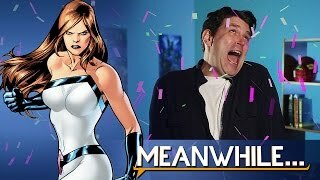 Meanwhile... Introduction Welcome to Meanwhile..., the show that introduces newcomers to the world of comics and connects it to the shows and games you already know and love. Every week, Meanwhile... will be taking a popular, trending character and explore their origin, giving an awesome starting point, and helping you jump onto current stories.